At the core of our Honest Chocolate products is our range of ethically and responsibly Bean to Bar slabs made from minimal simple ingredients. Our slabs are created from organic Tanzanian cacao in small batches at our production kitchen in Woodstock, Cape Town. They are tempered, moulded, and wrapped by hand. 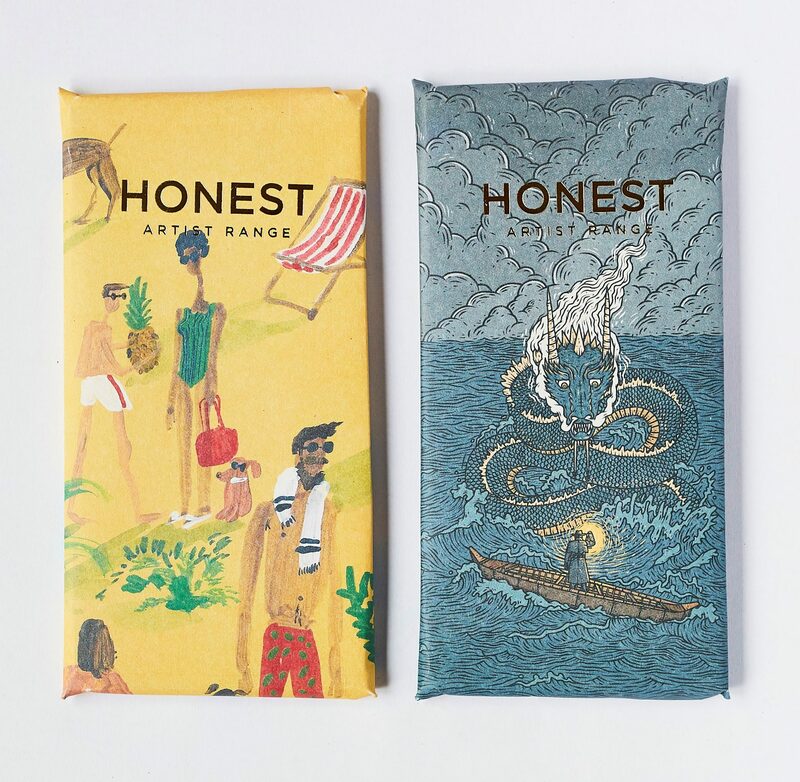 Find your favourite Honest Chocolate Slab between: 70% dark chocolate, 80% dark chocolate, 70% dark chocolate with Coconut Blossom Sugar, 70% dark chocolate with Naartjie, 70% dark chocolate with Kalahari Salt. Ethical Bean to Bar dark chocolate that is a work of art all the way from the wrappers to the experimental flavours. We regularly commission local Cape Town artists that we love and admire to illustrate their take on our latest flavour combination. Currently available: Pinapple & Buchu by Kirsten Sims, and Miso & Tamari Sunflower Seeds by Mike Sherman. Dark and intense with a hard chocolate outside and a soft, smooth, chocolatey centre. They melt in your mouth. Each praline is cut by hand and hand dipped using a traditional dipping fork. You can find all sorts of flavours at the Honest Chocolate Cafe in Cape Town or the Honest Chocolate shop in the Woodstock Exchannge, along with our hollow skulls and political figure busts for something fun. Great for kids and adults alike, spread it on your toast or croissant, or try it on all your favourite fruits for a delicious snack. Made with coconut oil and sweetened with agave. A mixture like no other, using our Tanzanian cacao for rich and creamy Honest Chocolate delight in a mug. Simply add hot water or your milk of choice in the comfort of your own home (although a few restaurants use us too!). The dried and fully fermented seed of the cacao fruit from which chocolate is made. The Honest Chocolate organic nibs are sourced from Tanzania through Kokoa Kamili and roasted in our Woodstock production kitchen. Use them in your sweet or savoury creations, they’re especially great in your morning smoothie or afternoon date ball.